For most of his long career in Ridgefield, the Rev. 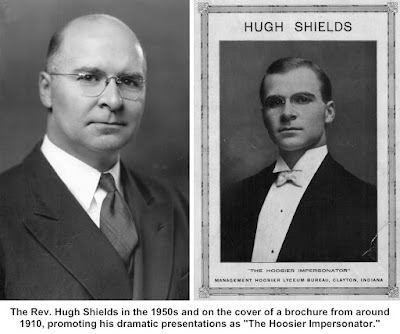 Hugh Shields served two congregations. He also served the needs of both the church and state, and he once served as a star of the Hoosier stage. Born in 1890, the Indiana native helped earn his way through drama school at Butler University by giving readings of famous people like James Whitcomb Riley, the Indiana poet. Performing under the name of “The Hoosier Impersonator,” Shields even had a management bureau that booked and promoted his appearances. Despite his training and critical praise, Shields soon felt a calling to the pulpit instead of the stage. He graduated from Yale Divinity School and became minister of the First Congregational Church here in 1919. He remained its minister until 1956 after which he was pastor emeritus until his death in 1971 at the age of 80. Among his accomplishments was the acquisition of the old Ridgefield Club building, converted to a church hall (it burned down in 1978 and was replaced by today’s Lund Hall), and the resurrection of the failing Ridgebury Congregational Church, which had been closed for some time. He was its pastor from 1923 until 1962. His being pastor of two churches created a busy Sunday schedule. He had hoped that he could do First Congregational services in the morning, and Ridgebury in the afternoon, but since most members of the Ridgebury congregation were farmers, they wanted a morning service. So on a typical Sunday, Ridgebury service was at 8 a.m., Sunday school at First Congregational at 9:30 and the service at 11. At 4 p.m., there was a junior high fellowship, and at 7, a senior high fellowship meeting. For each event, his wife, Alberta Reed Shields, was at his side. Shields was the only Ridgefield minister to represent the town in the Connecticut Legislature, and was elected to two terms starting in 1928. He was a popular speaker at community events and organizations, and belonged to Rotary, Lions and the Masons. His son, Reed, was a well-known Ridgefield attorney and probate judge for many years.